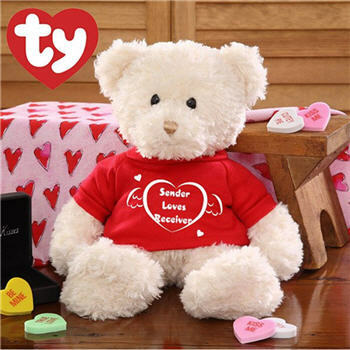 This irresistible big guy will certainly rock your world with his adorable, bright red tee attire! The soft and cuddly, plush Ty bear measures over a foot tall at 14", featuring movable arms and legs ready for plenty of hugs! Personalization Details: Senders and receiver's name up to 10 characters can be used to personalize your gift. Please ensure that names are spelled correctly. Orders placed for this item cannot be cancelled or refunded.